history. We hope you enjoy. 2012 was a great year for both Veronica Coombes (ASEA) and James Brace (ASEA ) , these training partners set multiple provincial records in the T54 wheelchair class thus becoming the fastest ever wheelchair athletes in New Brunswick . Veronica finished her 2012 season ranked 3 rd in Canada while James Brace qualified for his first National Championships where he finished 8th! What a year it has been for distance running in N.B! What is really remarkable are the results of our U17 athletes! Athletes such as Luisa Schwarz (FLTC) , Collin Belliveau (CEK), Josh Shanks (SJTC), Katie Robinson (SJTC) , Paul Tremblay (SJTC), Nick MacMackin (SJTC), Andrew LeBlanc(FFT), Chelsea Hall(FFT) , Taylor Dunn (FLTC) have set countless provincial records and have showed that athletes from New Brunswick can compete with the best in Canada . The future of distance running in our province is indeed bright! Once again, ANB helped the NBIAA host it’s Championships .They were held this year at the Moncton Stadium for the first time in it’s history. An amazing 9 NBIAA records were broken. The athlete of the meet had to be Matthew McLaughlin (FHS) who had a fantastic meet, breaking not only the junior boys NBIAA 400m record in a time of 51.17 (the previous record was held by Adam Gaudes in 51.84 in 2008 ) but also establishing a new 200m record in a time of 23.32 (previous record was 23.83 set by Gordie Hopkins back in 1997). He also finished 3rd in the 100m. We have to go way back in our history to see success like we had at the 2012 edition of the CIS Indoor Track and field championships. Our own Adam Gaudes captured the 600m silver medal on his birthday with a time of 1:19.05; a new University of Victoria record and New Brunswick record. He also helped UVic finish 2nd in the 4x800m by running a great leadoff leg. Guelph’s 4x800m women’s team composed of no less than 3 New Brunswick athletes (Genevieve Lalonde, Nadine Frost and Lydia Frost) captured gold with a time of 8:45.13 , while Uvic’s women’s team finished 2nd with New Brunswick’s Grace Annear running a great lead off leg. Let us not forget that Genevieve Lalonde (Guelph) finished 4th in the 1500m with a time of 4:32.54, In the same race Nadine Frost (Guelph) was 5th in 4:32.62 and Grace Annear ran the 2nd leg for the 4 x 400m UVic relay team that finished 4th overall with a time of 3:49.62. She also finished 5th in her heat of the 600m (11th overall) with a time of 1:35.06. Lydia Frost also finished 5th in the 1000m with a time of 2:49.35, Nadine Frost was 9th in the same race with a time of 2:53.15. Alex Black (UNB) finished 14th in the shot put with a toss of 11m66 while Chris Robertson (Western) 8th in the pentathlon with 3456 points. Way to go to our amazing Student-Athletes! -Bill MacMackin and Alex Coffin who were named Coaches of the year at the 2012 Sport NB Pitney Bowes Awards. Congratulation to all of these amazing individuals who have helped built our sport to what it is today ! Team New Brunswick captured a total of 6 medals (3 silvers and 3 bronze) at the 2012 Legion National youth Track and field Championships. The NB athlete of the meet had to be Nick MacMackin (SJTC) who ran a new Provincial Record in the U18 1500m of 3:55.51 to grab a silver medal (amazingly he broke the old record 10 years to the date that Matt Brophy had set in back in 2002. -Luisa Schwarz Of Fredericton won the silver medal in the U16 girls 2000 meter in 6:34.89 a New Brunswick record. -Josh Shanks of Chance Harbour won the bronze in the U18 3000m in a time of 8:51.82 . -Paul Tremblay of Saint John captured the bronze in a time of 4:35.25 in the U16 1500m Steeplechase which is also a New Provincial Record beating his own mark by 11 seconds. Aside from the 6 medals New Brunswick also established over 30 personal best and set 8 New Brunswick records. Making the 2012 Legion Championships the most successful in the last 12 years! 2012 was a great year for Combined Event athletes with Ashton Eaton setting a new World Record in the Decathlon and Jessica Zelinka a new Canadian Record in the Heptathlon. This was also the case in New Brunswick.s combined event star, Chris Robertson , despite being a first year Senior he set both the New Brunswick Indoor Pentathlon record (3521 points ) but also the outdoor Decathlon record (6457 points) . One of the proudest achievements of Athletics New Brunswick in 2012 was the development of the master’s category and in August, Saint John hosted the highly successful NCCWMC and Canadian Masters Track & Field Championships. Over 500 athletes from 22 different countries , including over 100 from New Brunswick, aged 30 to 94, took part in this 4 days event which saw many meet records, national records and even a few world record fall. The meet went extremely well and a big congratulation has to go to the local organizing committee and Saint John Track Club. It was great to see young local athletes help out and seeing that athletics is an activity you can do your whole life! 4- Rejean Chiasson Wins CDN Marathon Champs! ANB member Rejean Chiasson had quite a year in 2012 not only did he set a new provincial mark in the 15km and the half Marathon but also won the Canadian Marathon Championships in Ottawa with a time of 2:19.55. He has proved himself as one of the top endurance runners in Canada and has committed to represent New Brunswick at the Jeux de la Francophonie in 2013. He was also a finalist for Sport NB Pitney Bowes Awards. In short, a great year for the pride of Tilley Road. province in the 100m and 200m. He was also named ANB’s senior athlete of the year. ANB’s junior athlete of the year Ryan Cassidy had an amazing season, not only did he win the Nationals Junior 3000m Steeplechase title he was also selected to two national team. He first ran in the NACA Cross Country Championships in Trinidad where he finished 8th , he also competed at the World Junior Championships in Barcelona and finished 13th overall in a new Personal Best time of 8:56.88 . He finished the season being ranked 1st in Canada among juniors in the 3000m steeplechase. In fact his time would have ranked him first in Canada in the last 10 years! Shayne Dobson won 3 Golds at the Canadian Championships in the T37 category(400m ,800m and 1500m) . He was a finalist in Sport’s NB Pitney Bowes Awards and set 2 Canadian Records in 2012 . In early June , in Sheerbrooke he ran a strong 2:17.76 in the 800m T37. Shayne's performance broke the long standing Canadian record which was in place since 1986. Also in June at Legion Championships in Moncton he broke not only the New Brunswick provincial record but the Canadian National record as well. Shayne, paced by his teammates, blazed to an incredible time, finishing the three and a half laps in 4:34.74. A secial thank you to L'Acadie Nouvelle who supports Athletics every week covering stories and our athletes! 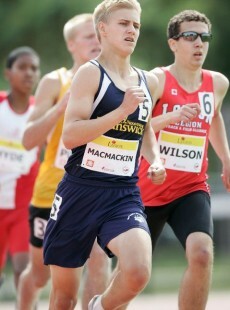 - Nick MacMackin, Saint John Track Club, broke the youth boys 800m record with a time of 1:57.06. -David Kerr, Fredericton Legion Tarck club set a new Junior Weight throw record with a throw of 14m90. - James Brace, ASEA, broke 3 T54 records in the 60m (12.31), 200m (33.06), and the 800m (2:17.58). - Veronica Coombes, ASEA, broke her T54 800m record by over 16 seconds with a time of 2:44.95. -Christelle Frenette , ASEA set a new New brunswick record in the Midget Shot put with a throw of 10.66m. - David Jefferson, Saint John Track Club, broke the masters 65-70 age group record in the long jump, with a jump of 3.16m, and in the weight throw (9.08kg) with a throw of 9.70m. - Andrew Justason, Fredericton Legion Track Club, broke the masters 40-45 age group record in the 60m hurdles with a time of 10.09, and in the pole vault with a jump of 2.85m. -Gavin Westbrook, Motley Crew Track club broke his own Bantam 1200m record with a time of 3:49.25. - Paul Gautier, Saint John Track Club, broke the masters 40-45 age group record in the weight throw (15.88kg) with a throw of 12.65m. - Edouard Bourque, Unattached NB, broke the masters 50-55 age group record in the 300m with a time of 46.50, in the 600m with a time of 1:48.85, the long jump with a leap of 4.49m, and in the shot put (6kg) with a throw of 8.82m. - Stephanie Dorion, Universite de Moncton, jumped 1.67m in the high jump. - Nick MacMackin, Saint John Track Club, raced the 1500m to a time of 4:12.47. - Brandon LeBlanc, Unattached NB, raced the 600m to a time of 1:29.49. - Matt McNeil, Saint John Track Club, won the fast paced 3000m in a time of 8:40.85. -Richard Ivey, Fredericton Legion Track club won the 60m in 7.09. The next meet, and the first meet of 2013, is the Moncton Open, on the 12th and the 13th of January. Dec 13 2012 - ANB names it's 2013 Podium Program Team! The 2013 Athletics New Brunswick Podium Program team list has now been released. This group of 53 athletes, aged 14-17 in 2013 represents New Brunswick’s finest Midget and Youth age group athletes. The female side of the group is led by Shawna McKay (Moncton), New Brunswick’s fastest women in 2012, Luisa Schwarz (Fredericton) and Victoria Leblanc (Saint John) who were both silver medalists at the 2012 National Legion Championships. Joshua Shanks (Lepreau), was a bronze medalist at the 2012 Legion Championships and is heading into the 2013 season as the #1 athlete in the country over the 3000m distance and leads the male contingent. Paul Tremlbay (Saint John), another national medalist and Matthew Mclaughlin (New Maryland) also represent New Brunswick’s depth in the program. Congradulation to Brian Gills who was introduce into the Oromocto and Area Sport Wall of Fame this past month After teaching , coaching and organizing events for 35 years, one would think Brian would relax and enjoy his retirement. However, he is as busy as ever working with clubs such as the Oromocto Legion track and Field CLub which brian started in 1971. Brian also continues to offficiate at the National Meets such as the Canada Games, National Legions and has officiated at the World Junior level. Brian's ideology complels him to contribute to the community and its youth and to encourage athletes to give back for the times given by others. Brian is often referred to as 'Mr. Track and Field', a name bestowed upon him by a friendly RCMP officer as Brian was rushing to a track meet.